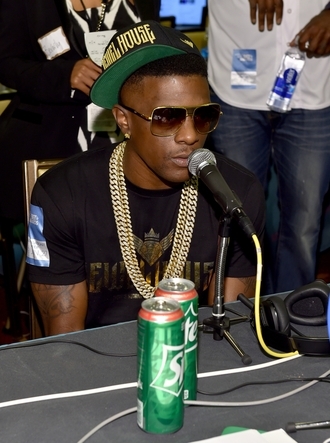 Hip hop star Lil Boosie, real name Torrence Hatch, has been diagnosed with kidney cancer. The Louisiana native confirmed his health status in a post on Instagram asking for fans to pray for him. Alongside a snap of him looking down at a breakfast table, the 33-year-old rapper wrote: "I need all my fans to pray for me. Doctor just told me I have cancer on my kidneys. Prayer is power that's why I'm letting the world know #prayfaboosie." Fans quickly flooded his timeline with messages of support, but within hours the post was deleted. According to TMZ, Boosie's management team had the For My Thugz artist take down his caption because they were not happy he suddenly revealed his condition. Boosie began his rap career in 1996 at the age of just 14, as one member of the Concentration Camp clique. He released his debut album Youngest of da Camp in 2000 and has since worked with the likes of Justin Bieber, T.I. and 2 Chainz. In March 2014, he was released from jail after serving five years behind bars for marijuana possession and probation violation. His battle with diabetes made headlines following an onstage incident in NYC in May 2015. He is believed to have fallen during a performance as a result of his diabetes medication going missing in transit. Earlier this year, the star collaborated with fellow rapper Tyga on his controversial track Pleazer, which is on the Gold Album: 18th Dynasty, but didn't chart after being released as a single on June 12. The musician is married to Walnita Decuir-Hatch and has seven children – Iviona, Tarlaysia, Torrence Jr., Toriana, Lyric, Ivy Ray, and MJ.